Bring vegetable broth to a bare simmer in a saucepan over medium heat and set aside. Heat olive oil in a large saucepan over medium heat, add onion, garlic and the stems of the chard. Cook for about 5 minutes, stirring occasionally, until softened. Add one cup of the broth, cook and stir, until almost absorbed. Now add chard leaves, cannellini beans and the rest of the broth. Cook and stir for a couple of minutes, then add mascarpone cheese, lemon juice and thyme. Season with salt, pepper and more thyme if needed. Top it with some grated lemon zest before serving. 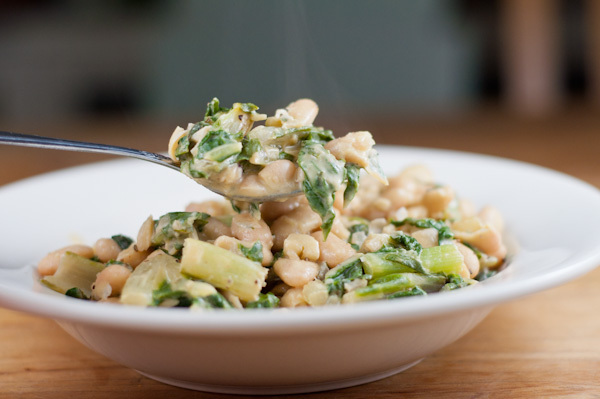 This entry was posted in Recipes and tagged cannellini beans, garlic, Lemon Zest, mascarpone, swiss chard, vegetable broth.